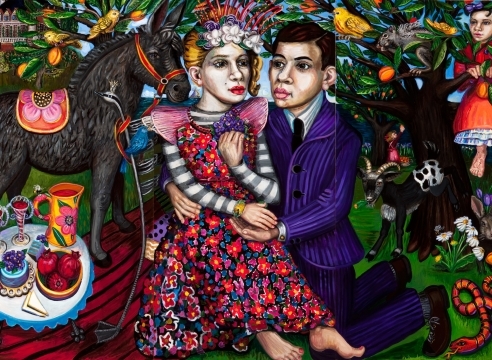 Portland artist Mary Josephson is known for her vibrant paintings that explore unique narratives of people and place. This exhibition includes paintings and drawings on paper in color and black and white. Here, her interest in global connections reveals a greater concern for the more complex and, consequently interrelated relationships of modern society. Josephson’s figurative imagery prompts us to consider the shared occurrences of life and the beauty that surrounds us. Josephson brings the viewer in, in a familiar way, while dealing with these broader concepts. Mary Josephson studied in Paris, France, at the École National Superior des Beaux Arts before receiving a BFA from the Pacific Northwest College of Art. She has exhibited her work for over 20 years including shows at the Portland Art Museum, the Oregon Health Sciences University, the University of Austin in Texas, and the Bellevue Art Museum, WA. Prominent collections include Safeco, Microsoft, Oregon State University, Legacy Emanuel Children's Hospital, Tacoma Art Museum, and the Portland Art Museum. Commissions include work for the Tigard Public Library, OR, Catlin Gabel School in Portland, Portland Fire and Rescue in conjunction with RACC, OR, Oregon Food Bank, and Multnomah County’s Juvenile Justice Center in Portland, OR.